This class represents the notion of a unary operator. 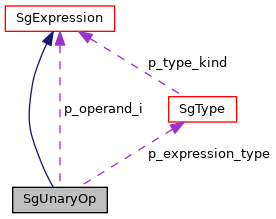 It is derived from a SgExpression because operators are expressions. There are no uses of this IR node anywhere. All expressions are derived from this IR node to build derived classes. Example unary operators include unary minus, unary plus, the address operator, etc. Definition at line 248735 of file Cxx_Grammar.h. Enum value defines operators as prefix or postfix, as appropriate, e.g. operator++(). This enum type provides support for specification of prefix/postfix operators such as operator++() using a simpler mechanism thatn that provided by C++. See C++ standard for details of specification of prefix and postfix operators. Definition at line 248779 of file Cxx_Grammar.h. This constructor builds the SgUnaryOp base class. Reimplemented in SgMatrixTransposeOp, SgUserDefinedUnaryOp, SgConjugateOp, SgImagPartOp, SgRealPartOp, SgThrowOp, SgCastExp, SgBitComplementOp, SgPlusPlusOp, SgMinusMinusOp, SgAddressOfOp, SgPointerDerefExp, SgNotOp, SgUnaryAddOp, SgMinusOp, and SgExpressionRoot. Returns number of operands (all unary operators return value = 1). This function is not used and is not a defined part a minumal interface for Sage III. Returns true if number of operands is zero, else false. This function returns boolean value given by (length() == 0). This function is not used and is not a defined part a minumal interface for Sage III. This function returns the next operand and is part of an older iterator interface within Sage II which didn't use STL, but implemented iterators for the operands (since their is only one for a unary operator and two for a binary operator we don't support such an iterator interface within Sage III. The goal of Sage III is a minimal easily maintained interface. This function is not used and is not a defined part a minumal interface for Sage III. 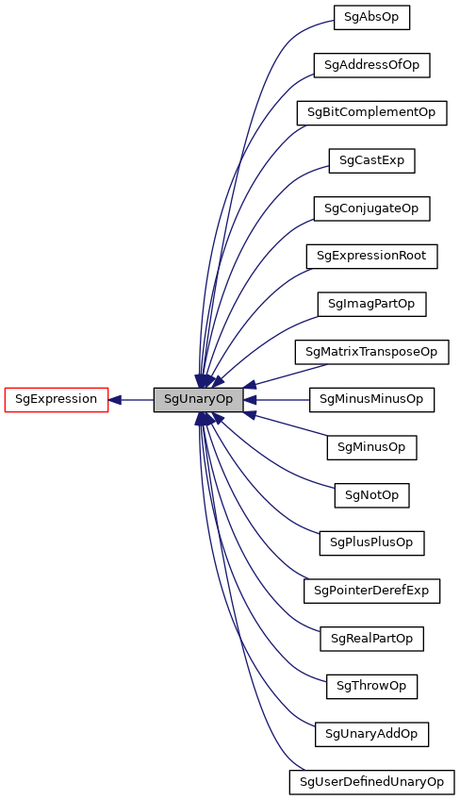 returns SgExpression pointer to the operand associated with this unary operator. This function allows the p_operand pointer to be set (used internally). This function is mostly used internally and is only required to support editing of existing SgUnaryOp objects. operand - sets value of internal p_operand pointer. Reimplemented in SgUserDefinedUnaryOp, SgThrowOp, SgCastExp, SgAddressOfOp, SgPointerDerefExp, and SgNotOp. This function allows the p_operand_i pointer to be set (used internally). Get the prefix/postfix mode of the operator. Get the prefix/postfix mode of the operator (if applicable to that operator). Set the mode (prefix/postfix) associated with this operator. This is an internal function, it sets up the prefix/postfix mode of the unary operator. Cast function (from derived class to SgUnaryOp pointer). This functions returns a SgUnaryOp pointer for any input of a pointer to an object derived from a SgUnaryOp. Returns valid pointer to SgUnaryOp if input is derived from a SgUnaryOp. This is the operand associated with the unary operator. Every unary operator is applied to a single operand, this variable stores the operand to which the unary operator is applied. Definition at line 249224 of file Cxx_Grammar.h. This SgType is the type of the operator (function type). The type is now computed where possible (in all cases except for SgCastExp). This allows us to save space and avoid having explicitly stored values be unset or set incorrectly. Definition at line 249228 of file Cxx_Grammar.h. This variable records the prefix vs. postfix semantics of the operator since the syntax of "operator++" cannot readily do so. This approach is simpiler to interogate than the C++ syntax for distingishing prefix vs. postfix. Definition at line 249232 of file Cxx_Grammar.h.